Very few of the Urban District Councils in England and Wales had powers to operate public transport systems, and Ramsbottom was one of the smallest, with a fleet of 12 in 1965. I think Colwyn Bay may have been holder of the ‘smallest’ title. Ramsbottom was absorbed into Greater Manchester at Local Government Reorganisation in 1974, while the fleet had passed to SELNEC in 1969. 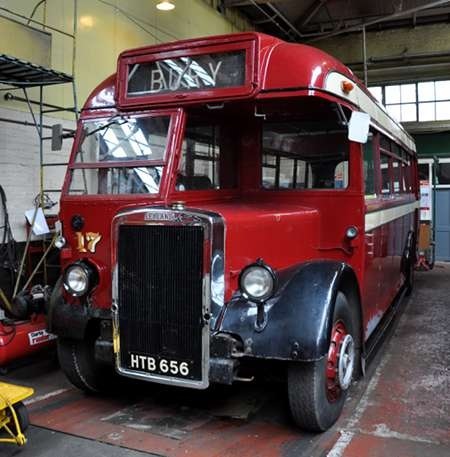 HTB 656 is a Leyland Tiger PS1 from 1947 and has a Roe body of B35R layout, with door. We see her in Boyle Street Museum on 19 August 2012. Ramsbottom had a high number of single deckers due to a low railway bridge at Stubbins precluding the use of double deckers on the core route through from Bury to Rawtenstall. Then around 1961 the road under the bridge was lowered allowing double deckers to pass beneath for the first time. The single deckers were replaced by a fleet of Leyland PD2 and PD3 double deckers, mostly with East Lancs forward entrance bodies. The last PD3 received was the very last to be built by Leyland as the Titan model was phased out following the onset of the bus grant and one person operation. Three Leyland Royal Tigers were sold, one to Rawtenstall and two to Haslingden with whom for a time Ramsbottom shared a General Manager. After the Selnec takeover all of the Ramsbottom fleet of East Lancs double deckers were transferred to Bury, in early 1972. In exchange Ramsbottom got seven of Bury’s REN registration Atlanteans with three (I think) of the PDR2s which had been ordered by Bolton in the 6802-16 series. Of the Ramsbottom double deckers, 1 and 2 were PD2s and had open rear platform bodies, all the rest were forward entrance, 3 was a PD2 also. 1 had the Leyland tin front and 2/3 the St Helens moulded front. 1 and 2 were withdrawn fairly quickly, both still in maroon in 1973, 3 was one of the first repaints into orange and white. The remainder were PD3s, 4 and 5 also had the St Helens front and 5 was also in maroon for quite a while, it later became a trainer. The rest (6-11) were all exposed radiator and were virtually identical to Stockports last few, slight differences on 10 and 11 were hopper type vents on the windows. These all eventually ended up at Wigan, I vaguely remember one of them being at Queens Road for a bit.